Prices can only be estimated as they subject to change depending on the Euro/$ exchange rate. Diatom taxonomy and ecology. From local discoveries to global impacts. Festschrift in honor of Prof.Dr. Horst Lange-Bertalot's 75th birthday. Editors: Andrzej Witkowski; John P. Kociolek; Pierre Compère. 2012. (Beihefte zur Nova Hedwigia, Volume 141). 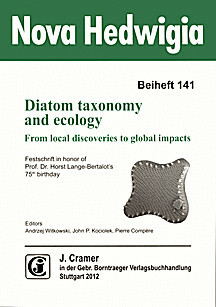 The twenty-nine peer-reviewed contributions to this impressive volume sweep the entire range of current research on diatoms - from the taxonomy of freshwater and marine diatoms, the fossil record of both terrestrial and marine habitats, planktonic diatoms, potential of diatoms and ostracods as bioindicators, application of diatom assemblages to climatic reconstructions, the use of molecular tools in phylogeny, tracing the threat of invasive and potentially toxic diatoms to the highlights of the diatom collection of Józef Pantocsek. The wide range of topics covered herein delineates the equally wide range of research interests of Prof. Horst Lange-Bertalot. The papers were contributed by friends and colleagues on the occasion of his 75th birthday which was celebrated during the 5th Central European Diatomologists Meeting (=25th German-speaking Diatomologists Meeting) in Szczecin, Poland, in February 2011. 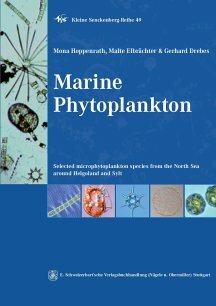 Many of the authors have benefited from Prof. Lange-Bertalot´s profound knowledge of diatoms in general, and his floristic skills in particular. The impact of his work on diatom research has been extraordinary, with important implications for ecology (from water pollution to climate change), biodiversity and conservation sciences. This has been due in large part to the breadth and depth of Prof. Lange-Bertalot’s research record in four areas: evaluation of water quality using diatoms, floristics with a focus on Europe, floristics with a worldwide perspective, and synthetic work to organize and integrate these other studies. This tremendous volume honors Professor Horst Lange-Bertalot, one of the pre-eminent diatom taxonomists. 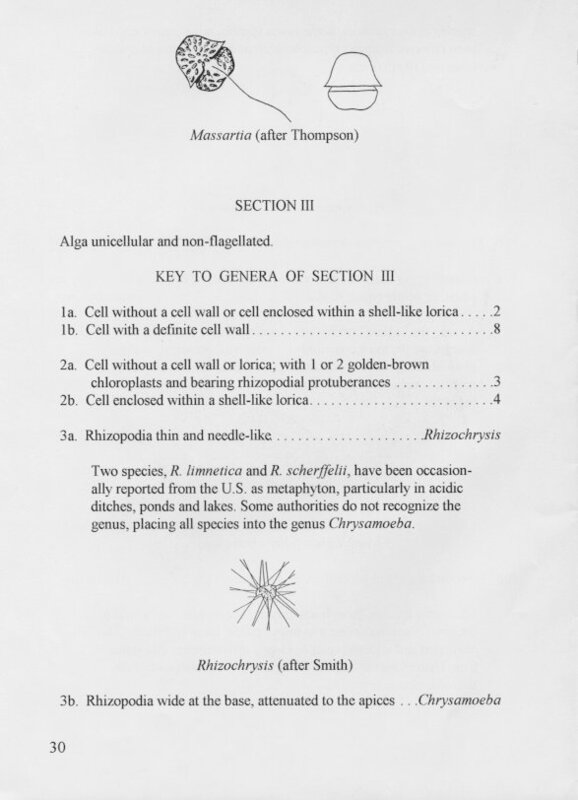 Dillard, Gary E.: Common Freshwater Algae of the United States An Illustrated Key to the Genera (Excluding the Diatoms). 2008. 2. edition. 188 pages, 299 figures, 22x16cm. Updated and revised! This manual has been prepared to provide freshwater biologists a means to identify some to the more commonly encountered freshwater algal genera of the United States. Keys, representative illustrations, and general ecological notes are provided for some 300 genera, excluding the diatoms. Although there are many excellent taxonomic treatments of freshwater algae, most require detailed familiarity with algal morphology in order to use the identification keys successfully. 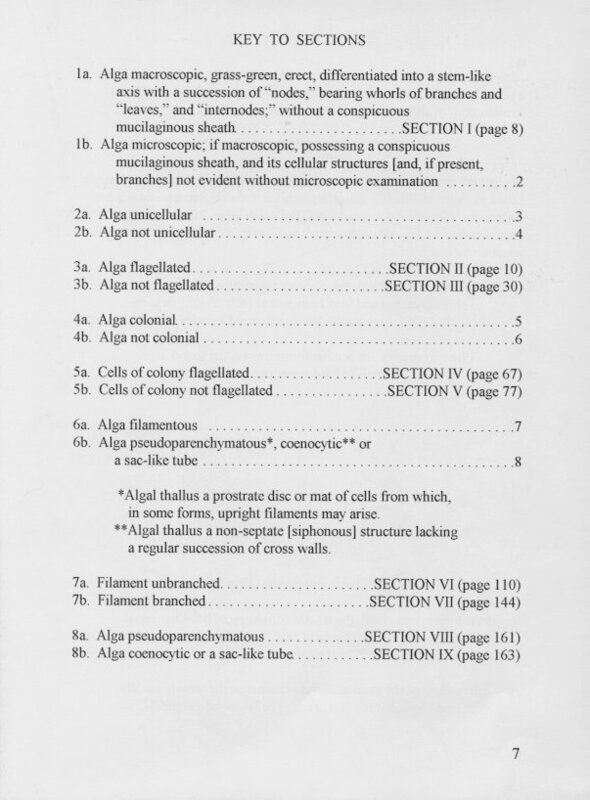 To the extent possible, formal terminology common to most taxonomic treatments has been avoided in the preparation of the keys included in this manual. An extensive bibliography provides references to more detailed taxonomic treatments for those who wish to proceed to species identification. Our concepts of the algal classes, orders and families, due to new information largely provided by electron microscopy and molecular biology, are presently in a state of change. The manual therefore does not include placement of the genera into supra-generic taxa, however, the bibliography includes references providing such information. Audience: students, professional aquatic biologists, ecologists and others interested in the phycology of the freshwaters of North America. 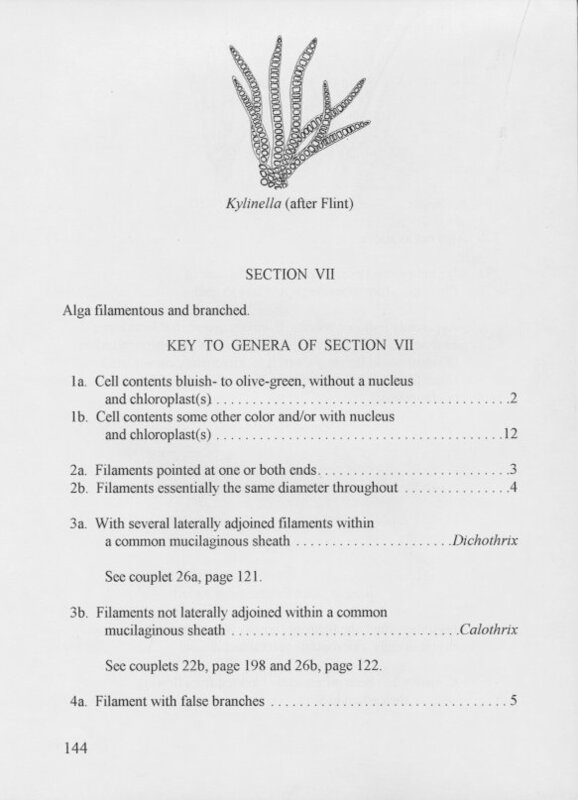 **Modern approach to the classification system of Cyanophytes includes No. 38/39, 43, 50-53, 56, and 59 above. Volume 1: Catalogue. X, 525 p.
Volume 2: Atlas, op. 2-l06, plates 1-395, 597 p.
Volume 3: Atlas. op. 107-175, plates 396-772, 619 p.
Ruzicka, Jiri: Die Desmidiaceen Mitteleuropas. Band I.